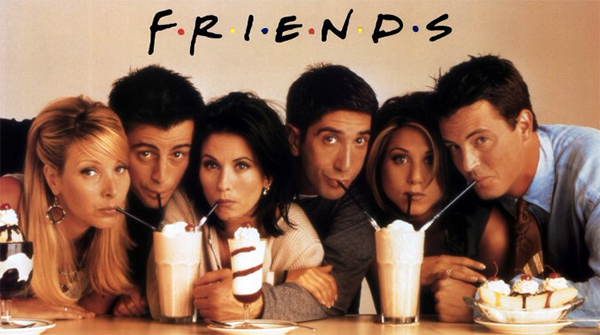 When I was growing up it was a Thursday night ritual to watch “Friends” with my family. Don’t judge my parents here, ok. The show started in 1994. I was, well, young. Young enough to not have walked in the halls with the third graders. My shoes still likely had cartoon characters; my leggings definitely had stirrups. I did not understand the complexity of the jokes, or maybe, the simplicity of themes portrayed on the show. Over the next ten years I grew up with the voices of Joey, Ross, and Rachel drifting up the stairs when I was falling asleep. I’d sneak peeks, getting glasses of water, or brushing my teeth again so I could see what my mom was laughing at. As I got older, I earned my spot on the couch for the 7:30 pm time slot. I started to understand the jokes, and my love for the characters increased, even though I didn’t quite have the life experience to relate to what was depicted on screen. I cried at the series finale, tears rolling down my cheeks as Rachel told Ross, “I got off the plane!” He’s her lobster don’t you know. I think I was a freshman or sophomore in high school. I was given all ten seasons of the show for various birthdays and Christmases and I took all ten seasons to college. I fell in love with my first serious boyfriend, who is now my husband, in his basement room in the co-ed housing that we lived in. I got “in trouble” too many times to count as I stayed passed the curfew on the boys floor night after night to watch this show with Dylan. We laughed, loudly, and I snuck back up to the girls floor at 2 am most nights of the week. I was young, and very much intrigued by a boy, and rolled my eyes that I even lived in a place that had curfew for college student. Now, “Friends” re-runs are on “Nick at Night”. “Nick at Night!” I do not have cable, but I do know that the shows they play on Nickelodeon past 10 o clock are old. Like “Cheers”, or “Laverne and Shirley” or something my parents used to watch. Not the shows I grew up with. So, yes, I’m aging I suppose. Now though, I’ve been watching the show on Netflix, and binging. All ten seasons! We started in January and now we are Season 3. I still love the jokes, and the characters, and Dylan and I still laugh, loudly. I’m not sure if it is a stretch to call a ten year series beautiful, but the joy that this show brings to my day to day life now, and through out my “formative years” really is something I enjoy. You’ve heard the theme song, and you know where to clap your hands. “Your job’s a joke, your broke, your love life’s DOA.” I do not view my job to be a joke, I think we do wonderful work. My love life has had a really successful year. However, there is some crazy truth to watching a t.v. show about a bunch of 20 somethings, even if the show was created, gulp, twenty years ago. You do not always end up where you think you will when you are in the third grade. Your friends move and change and get married too. I just found out a best friend of mine is moving again to a different city. I cried, even though she will only be an hour away. Life is messy right? Sometimes things happen that don’t make a lot of sense. There are five feet of snow on the East Coast and I wore flip flops in Colorado yesterday. I think global warming is real. A loving father of four was in an accident this week – he died and his high school aged daughter walked away unharmed. That’s not fair. We want to be healthy and make good choices, and yet our food makes us sick. Kids are abandoned, parents leave, opportunities are stretched and prohibited based on privilege in ways we can’t even begin to solve. I think about these things. Too much. In the midst of those warbled social issues and situations that make us scratch our heads, or hurt our stomach because they don’t make sense, we need to find things to clap at. We need to laugh, and to be surrounded by friends. We need to joke. We need continuity and history, and connection. That is where I find beauty when situations lack solutions, or when anxiety overtakes. And I need Ross, Rachel, Joey, Monica, Phoebe and Chandler, in ways I am embarrassed to admit. No biscotti or nail polish this week. Sorry.